I am always looking for healthy snacks to try. Whilst I do not eat a vegan diet 100% of the time anymore, I still try to eat healthy and eat better. Plantain chips are a healthier and tastier option to crisps. 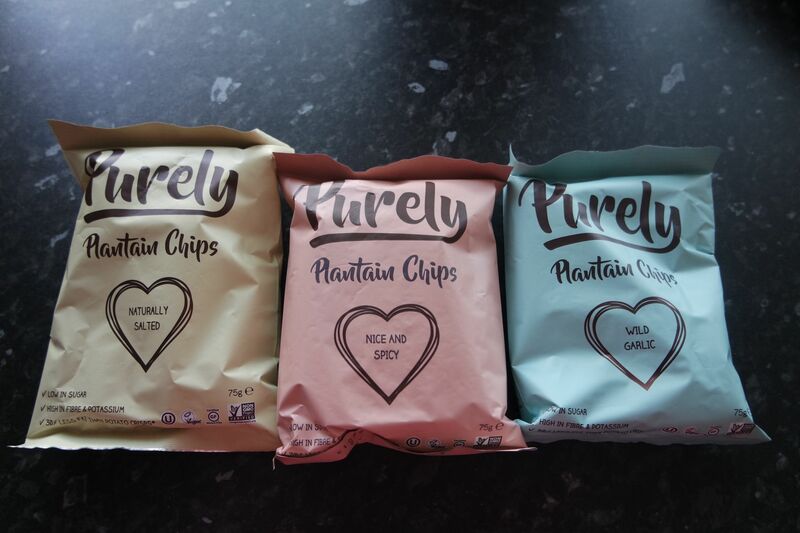 I have been trying three different flavours from Purely: naturally salted, nice & spicy and wild garlic. I have never been a massive crisp fan but when I do eat crisps I like to go for simple flavours so these three were ideal to try. Their chips are gluten free and vegan so great if you have intolerance’s or are vegan. You would be surprised how many crisps have dairy in! I find plantain to be quite thick and crispy, I really like the texture of it. I think my favourite had to be the nice & spicy ones. The bag was quite big, you get a lot more in a bag than a normal pack of crisps. I really liked the spicy flavour. The other two tasted great as well but this one stuck out. Have you ever tried plantain? Oooh these sound right up my street! Will have to look at these! I’ve never tried these but they sound really nice! The spicy ones would be my favourite.